Bows Jewellery tattoos. 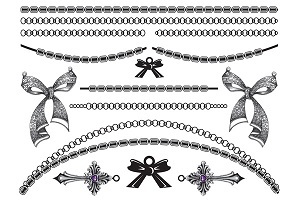 Tattoos sheet contains numerous different chains, bows and bracelet tattoos. Sheet measures 15cm x 11cm. Cut the tattoos from the sheet and wear in combination or at different times. Easy to apply and remove.